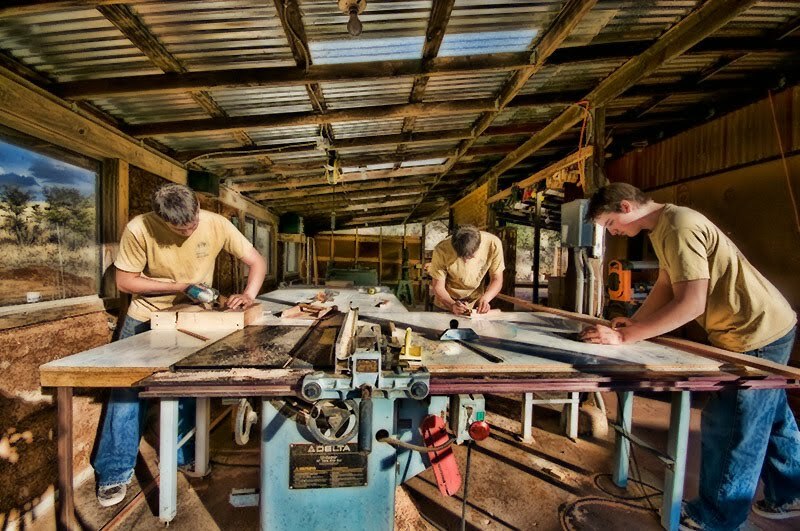 Looking at our children, it’s becoming obvious that their capacity for workand to accommodate the vast amount of information coming their way, far exceeds what we are capable of as parents. To no one’s surprise, it’s a complex world, simultaneously full of challenges and opportunities. I never cease to be amazed at their ability to respond to whatever comes their way. It’s now more apparent than ever that our role has been only that of supporting them and providing them a platform, a base from which they can spring into the rest of their life. Looking at the work they are doing, it’s so easy to see that they will far exceed anything that we have done. I can’t think of anything more satisfying. The most recent demonstration of their abilities was this past summer, where in northern New Mexico, our two oldest, Benito 19 and Oso, then 17 helped build a beautiful small insulated adobe house for their grandmother, Athena’s mom, Rina. After years of living in Santa Fe, Rina returned to her native Santa Clara Pueblo to be close to family. 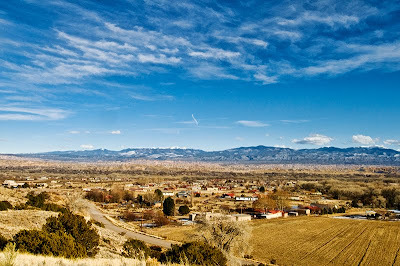 I wrote the previous blog post on northern New Mexico to give some insight into the area where her house was built. Grandmothers can be great, Rina is no exception, she basically turned he need for a house into an opportunity for her grandchildren to develop themselves and display their talents. Benito worked on the building from start to finish, being there from the foundations through the walls andfinish plasters. 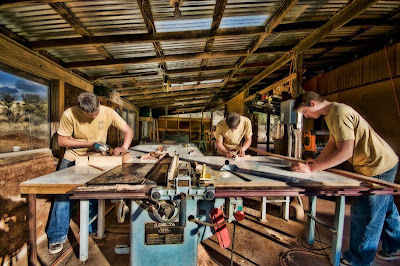 Anything that was done with wood, from the roof to the finish carpentry and furniture, involved our other son Oso. Eating area and office desk. The house itself, approximately 700 sf, is a tribute to Rina’s architectural design skills. The house is simple in shape, rectangular, but tastefully divided on the inside with curving walls that transform the angularity of the outside into subtle interior sculpture. 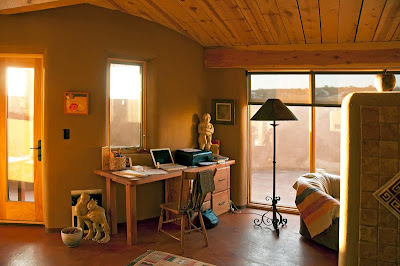 As a whole, the little adobe house is a beautiful work of art and yet at the same time, ever so practical and functional. Desk made by our son Oso. 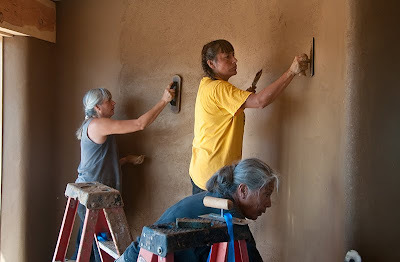 There was nothing elaborate in the way of materials, the same ones that have been used in the houses and kivas of Santa Clara Pueblo for centuries. The wood was local, as were the adobes used for the walls. The finish plasters were simple and elegant, a medium brown blend of finely screened clay with sand and straw. 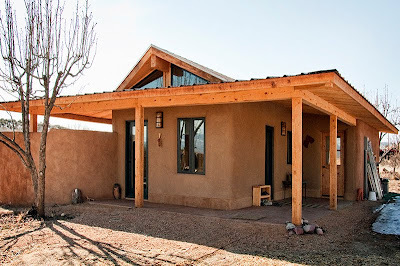 For me, one of the beautiful things about Rina’s little house is that, instead of being a cheap imitation (Santa Fe style) of the old pueblo style of building, her house is a thoughtful interpretation of the past and yet very contemporary. 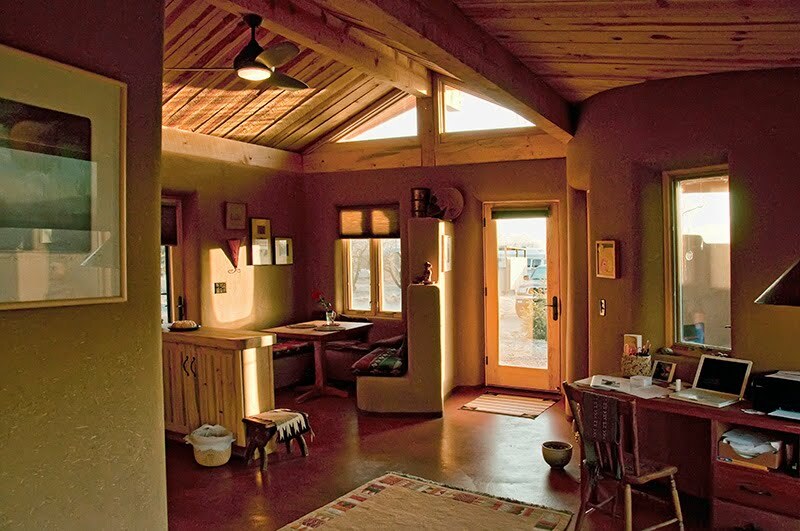 The comfort level is high, the passive solar design requires little to no additional heating or cooling. Athena, sister Roxanne and mother Rina plastering. 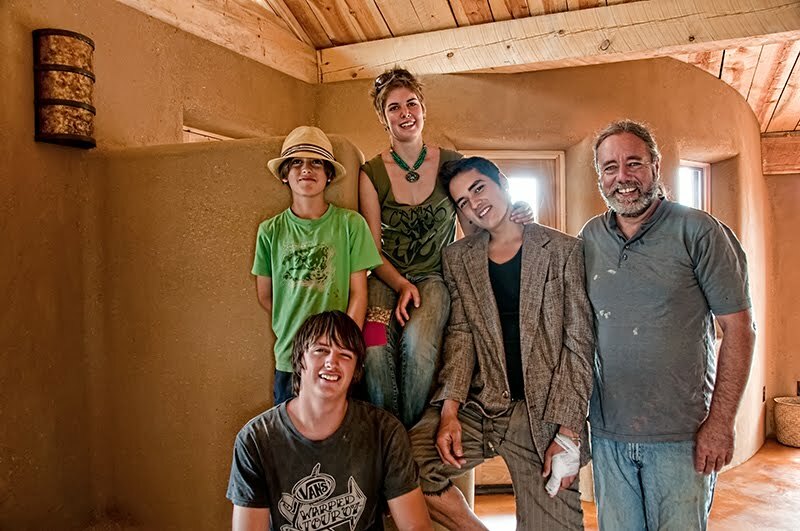 We worked the final phases of the house for the finish plasters along with Rina, Athena’s sister Roxanne and Benito’s then girlfriend, Ariela. Roxanne with her Kubota backhoe dug the trenches for the foundations and laid the adobes for the walls while husband Tim was the overseeing contractor. Outside, Benito and Oso’s cousin, Dimitri, age 19, built a wood fence to enclose the property. Our boys, Kalin the youngest, Ariela and Roxanne’s husband Tim. Oso at work in his shop on the kitchen cabinets. In all, it was a project that gave meaning to the word family, notably for someone like myself who grew up an only child. I’m grateful for the opportunity to have been part of these kinds of projects with the Naranjo/Swentzell family over the years. Some of those include the construction of Roxanne’s gallery in Pojoaque, NM and the Always Becoming project in Washington D.C. This winter takes us to the Denver Art Museum. Once in a while we get 9 year old Kalin to work. 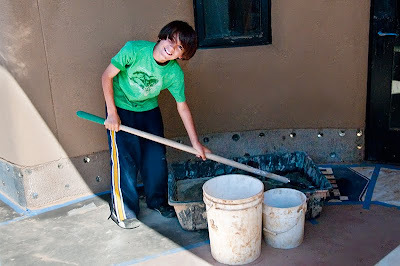 Since then our boys have gone on to other projects, Benito just took on his first plastering job that was totally his responsibility. He also does artistic blacksmithing and stenciling work. After the work he did on grandmother Rina’s kitchen cabinets, he did more of the same for assorted great aunts. Kitchen counters made from juniper wood harvested on our property and milled by Oso. Thanks for sharing the story and photos. Beautiful work from some very talented sons. I have been checking into your website for years always with the dream of building my own strawbale home. 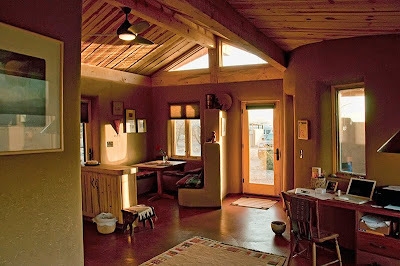 So far no strawbale home. She'll appreciate the comments, besides a grandmother, she makes a pretty good mother-in-law. One that keeps me raising the bar of what a son-in-law, could be. The house you've built is absolutely terrific, very elegant, beautifully laid out. I admire your craftmanship and dedication. I am wondering if there is a way to get the plans for this house. If, so, will you pleae email me the details. Thank you for sharing this, as it is just about perfect. Same from Romania, if you are willing to share the plans, i would be incredibly grateful. 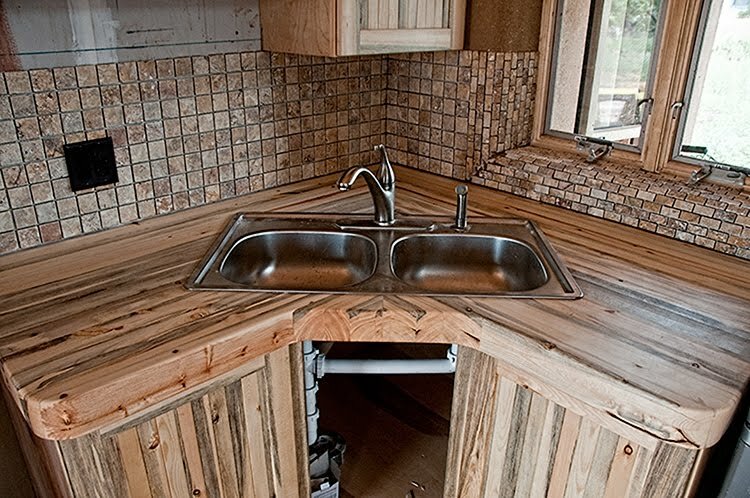 It is an impressive work and you are using a building method that is becoming less and less common here. Decades ago it was a normal thing to build your own house like this, now-days nobody even things of creating his own house. Congratulations for the entire team. I live in Venezuela on an island in the Caribbean and am lookingto for something like this to build here- adobe style. 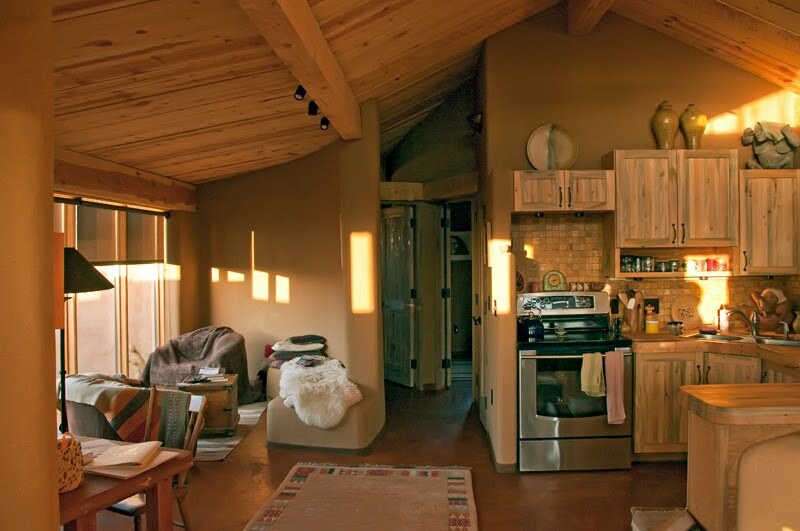 Where can I get plans to this or similar houses? I just now am seeing this house for the first time – I love it! Any chance on posting what the floorplan is? Can straw bale be built in Michigan? Thank you for the gift of decades of inspiration. Your work is always so beautiful. I hope I have the wonderful opportunity of working together with you again someday. Looks like Benito and Arjuna are finding their own, with the grace and clarity of their parents.